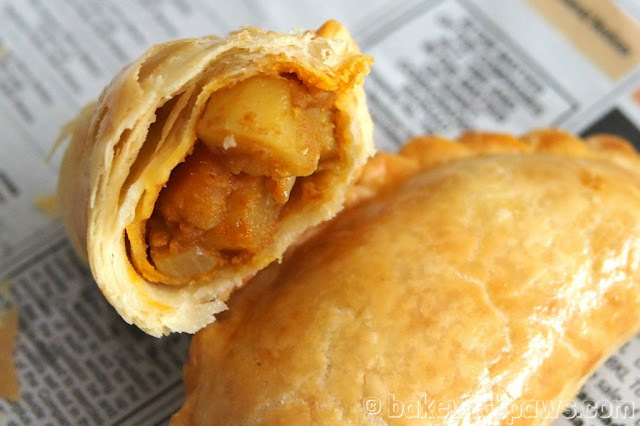 I have been thinking of making curry puff for long time. 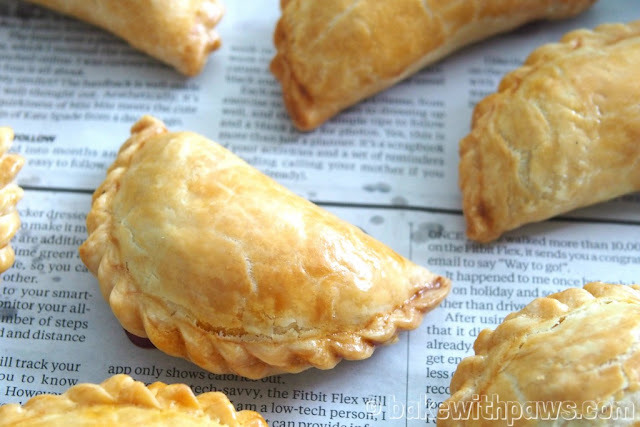 But, I couldn’t find a good recipe for baked curry puff pastry. A few weeks ago, my sister shared her pastry recipe that she uses to make Siew Pao for her kids. 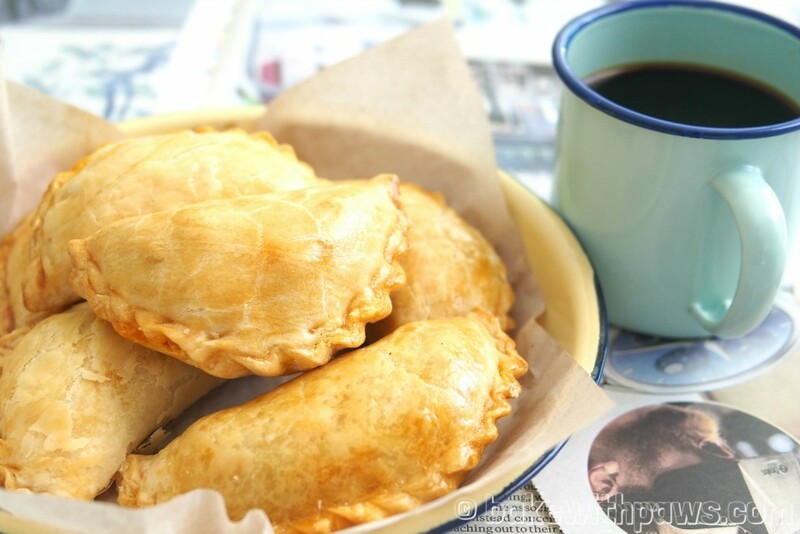 I thought it will be perfect for curry puff. Using this recipe, I got a light flaky curry puff that hits the spot! Heat oil in a wok and saute garlic, onion and curry leaves. Add in curry paste and stir for a while then add in potatoes. Add some water and season with salt and chicken stock. Turn down the fire and let it simmer till potatoes are soft and curry is dried. Keep aside to let it cool before using. Knead ingredients (A) and ingredients (B) separately into a dough by hand. Let them rest for 10 to 30 minutes. Divide and shape the dough into 20 balls for each dough, around 19g for water dough and 13g for oil dough. Wrap dough (B) into dough (A). Flatten into a thin sheet using a rolling pin and roll up like a swiss roll (do it twice). Flatten the dough and cut with “dough cutting ring”. As I do not have this size of cutting ring at home, I used plastic container cover (10cm or 4 inch diameter). Place the potatoes filling, pinch the edges and crimp. Brush the pastries with eggwash and bake for about 20 to 25 minutes or until golden brown. Remove from oven. You may serve it hot or enjoy it cooled. Thank you for trying this recipe and let me know the feedback. All my family members love this Curry Puff too. Glad to hear that you like it too. You can tag me in Instagram if you have Insta account too. Don't worry about the look. Practice make perfect. Hi Yean Ley, what would you suggest if I am to save some curry puff for later. Shall I freeze it before I bake it or freeze it after I baked it? I have tried freezing it after baking. Remove from freezer and back to room temperature first before toasting in the oven. The taste is still ok. 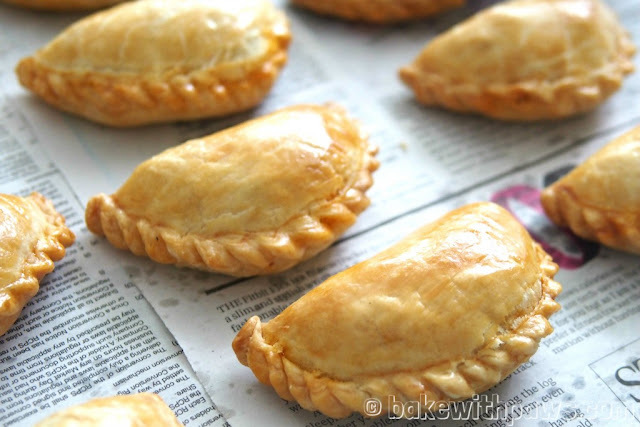 But, I have a follower told me she froze the unbaked curry puff and bake it when wanted to eat. I guess both way work too.